62 | TH E M R EP O RT O R I G I NAT I O N S E R V I C I N G A NA LY T I C S S E C O N DA R Y M A R K E T SECONDARY MARKET THE LATEST Mortgages Rank Third Among Consumer Complaints in Latest CFPB Snapshot Previously the most-complained about financial product, mortgages now rank behind debt collection and credit reporting. 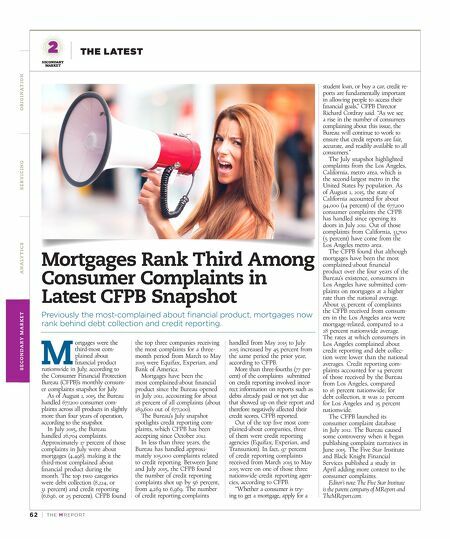 M ortgages were the third-most com- plained about financial product nationwide in July, according to the Consumer Financial Protection Bureau (CFPB)'s monthly consum- er complaints snapshot for July. As of August 1, 2015, the Bureau handled 677,200 consumer com- plaints across all products in slightly more than four years of operation, according to the snapshot. In July 2015, the Bureau handled 26,704 complaints. Approximately 17 percent of those complaints in July were about mortgages (4,498), making it the third-most complained about financial product during the month. The top two categories were debt collection (8,224, or 31 percent) and credit reporting (6,696, or 25 percent). CFPB found the top three companies receiving the most complaints for a three- month period from March to May 2015 were Equifax, Experian, and Bank of America. Mortgages have been the most complained-about financial product since the Bureau opened in July 2011, accounting for about 28 percent of all complaints (about 189,600 out of 677,200). The Bureau's July snapshot spotlights credit reporting com - plaints, which CFPB has been accepting since October 2012. In less than three years, the Bureau has handled approxi- mately 105,000 complaints related to credit reporting. Between June and July 2015, the CFPB found the number of credit reporting complaints shot up by 56 percent, from 4,289 to 6,969. The number of credit reporting complaints handled from May 2015 to July 2015 increased by 45 percent from the same period the prior year, according to CFPB. More than three-fourths (77 per - cent) of the complaints submitted on credit reporting involved incor- rect information on reports such as debts already paid or not yet due that showed up on their report and therefore negatively affected their credit scores, CFPB reported. Out of the top five most com - plained-about companies, three of them were credit reporting agencies (Equifax, Experian, and Transunion). In fact, 97 percent of credit reporting complaints received from March 2015 to May 2015 were on one of those three nationwide credit reporting agen - cies, according to CFPB. "Whether a consumer is try- ing to get a mortgage, apply for a student loan, or buy a car, credit re- ports are fundamentally important in allowing people to access their financial goals," CFPB Director Richard Cordray said. "As we see a rise in the number of consumers complaining about this issue, the Bureau will continue to work to ensure that credit reports are fair, accurate, and readily available to all consumers." The July snapshot highlighted complaints from the Los Angeles, California, metro area, which is the second-largest metro in the United States by population. As of August 1, 2015, the state of California accounted for about 94,000 (14 percent) of the 677,200 consumer complaints the CFPB has handled since opening its doors in July 2011. Out of those complaints from California, 33,700 (5 percent) have come from the Los Angeles metro area. 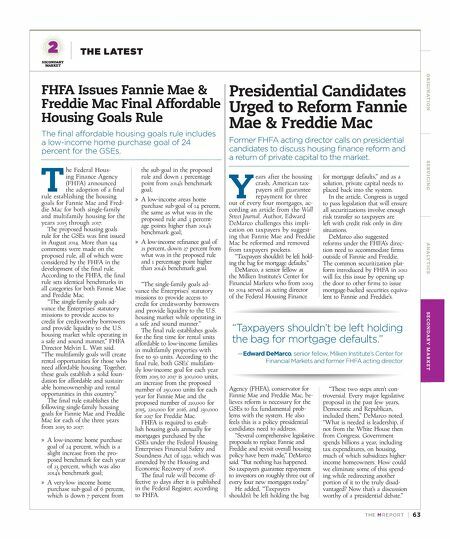 The CFPB found that although mortgages have been the most complained-about financial product over the four years of the Bureau's existence, consumers in Los Angeles have submitted com - plaints on mortgages at a higher rate than the national average. About 35 percent of complaints the CFPB received from consum- ers in the Los Angeles area were mortgage-related, compared to a 28 percent nationwide average. The rates at which consumers in Los Angeles complained about credit reporting and debt collec - tion were lower than the national averages. Credit reporting com- plaints accounted for 14 percent of those received by the Bureau from Los Angeles, compared to 16 percent nationwide; for debt collection, it was 22 percent for Los Angeles and 25 percent nationwide. The CFPB launched its consumer complaint database in July 2012. The Bureau caused some controversy when it began publishing complaint narratives in June 2015. The Five Star Institute and Black Knight Financial Services published a study in April adding more context to the consumer complaints. Editor's note: The Five Star Institute is the parent company of MReport and TheMReport.com.